Ryan Asalone and Dylan Arnold, both L’17, work opposite sides of the courtroom in Hampton, Virginia, but each arrived there by following the same track. Asalone and Arnold, recipients of Bridge to Practice fellowships, are beneficiaries of a highly successful post-graduate program created by the law school in 2012. 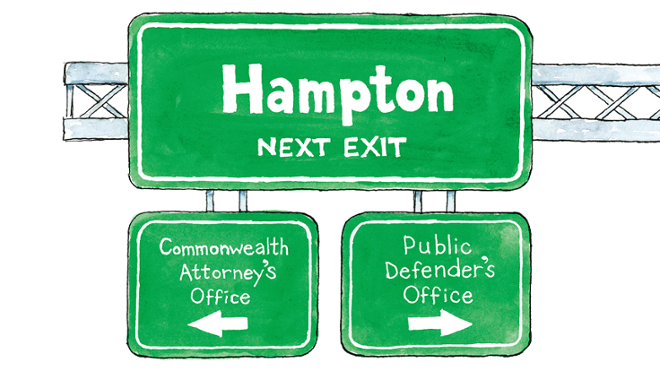 “The program has been absolutely essential to my success so far,” said Arnold, who joined the “gangs, guns, and drugs” prosecution team with the Hampton Commonwealth’s Attorney’s Office full time after a bridge fellowship there last year. The bridge program began with five fellows and has grown steadily, with 18 fellowships awarded to members of the Class of 2018. Fellowships come with a $2,000 monthly stipend and extend for up to four months. Fellows are not paid otherwise. Among the most important considerations are the applicants’ efforts to secure a placement in nonprofit organizations, the courts, governmental agencies, and public law firms with public interest or pro bono practices. The program demonstrates Richmond Law’s commitment to students after graduation, according to Tara Casey, the professor who directs the program. The program provides more than financial support. Casey meets with each fellow by phone or in person at least once a month. Their conversations focus on setting clear short- and long-term goals and analyzing how the work is going. So far, more than 90 percent of fellows have landed jobs by the end of their fellowships, Casey said. “The program is successful because of the quality of the fellows,” Casey said. “They’re good lawyers, good people, and strong ambassadors for the law school.